The last farm we visited was Gainesway Farm in Midway. 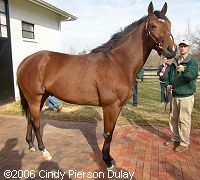 There are 14 stallions here but the one everyone was interested in was Afleet Alex. 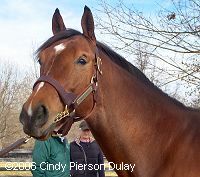 He was retired the first of December and only recently arrived at the farm, so he was in a small barn away from the other stallions as a sort of quarantine. Every 30 minutes or so, they would walk everyone back to this barn to show him. He seemed to like all the attention and didn't mind being petted at all. He also liked to chew on his leather lead shank whenever it came close enough he could grab it. 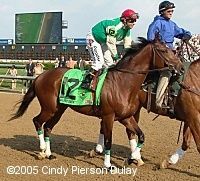 Since he is so popular and I have had requests for his pictures, here is a whole page of just Afleet Alex for you to enjoy, including one from the Kentucky Derby post parade for you to compare his racing fitness to how he is now. 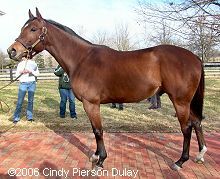 Check here for the other Gainesway Farm stallions. 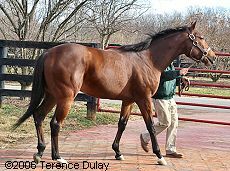 Here are the other farms we visited: Lane's End, Stonewall Farm, Ashford Stud, and Vinery. 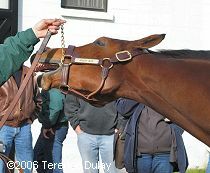 For more Afleet Alex pictures, check his Preakness and Belmont photo pages.